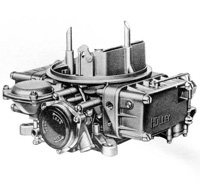 The 'modular' Holley carburetor appeared in 1957 and was used on most makes at one time or another after that. It replaced the earlier 'concentric' Holley carbs. 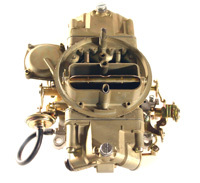 These carburetors were produced in 2, 3 and 4-barrel variations and are still available as aftermarket performance and replacement carbs today. 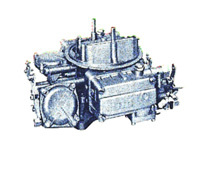 Holley modular carbs have detachable float bowls, metering plates and choke assemblies. 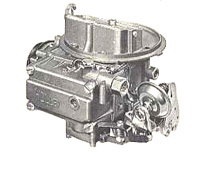 The 4V carbs have a square-bore flange which is larger than the earlier Teapot carburetor flange. The Holley 2300 is the 2-barrel version. This illustration shows an early Ford 2300C (C = automatic choke). This is a 4150C carburetor. 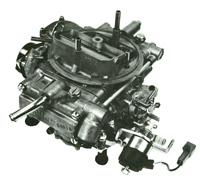 The 4150 series carbs have a secondary metering block, whereas the 4160 carbs have a metering plate. The Holley 4160 has no secondary metering block, so it uses a shorter transfer tube from the front float bowl to the rear. 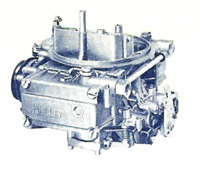 Holley 4150G carburetors have a governor diaphragm assembly on the passenger side and were used on trucks. The Holley 4180C is an emission controlled design introduced in 1979. It can be distinguished by the idle mixture screws which are in the throttle body, instead of in the metering block. Some muscle car Holley carburetors, such as this Chevrolet 4150 carburetor used 'competition style' fuel bowls. These have a diagonal fuel inlet and use a center-hung float. Mopar Six-Packs used three Holley 2300 carburetors, as did Chevrolet big-block 3X2 setups. A Corvette 427 intake with three 2300 carbs is shown here. These used large secondary actuating diaphragms.